Back on the promo trail, Amanda Seyfried posed on the blue carpet yesterday evening(July 16th) for the premiere of 'Mamma Mia! Here We Go Again' at the Eventim Hammersmith Apollo in London. 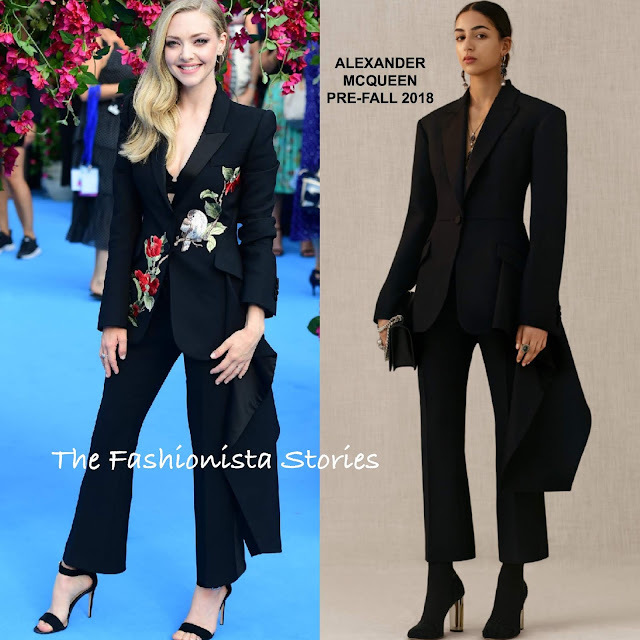 Turning to one of her go to designer brands, she wore a ALEXANDER MCQUEEN PRE-FALL 2018 black floral embroidered & draped panel blazer and crop trousers. While the plain black suit in the look book is nice, the asymmetrical floral embroidered panel adds an interesting detail to the suit. Accessorized with TIFFANY & CO jewelry and black sandals, she finished up with a flawless beauty look. Tags: alexander McQueen, Amanda Seyfried, fashion, Movie Premiere, Tiffany and Co.